It was time for a change though. Bella will be 8 in a couple of weeks and Mia is 5 1/2 now. Both girls have out grown what we had before. Plus, ok, lets be honest. I discovered this awesome bedding and it inspired me to totally re-do the entire room. 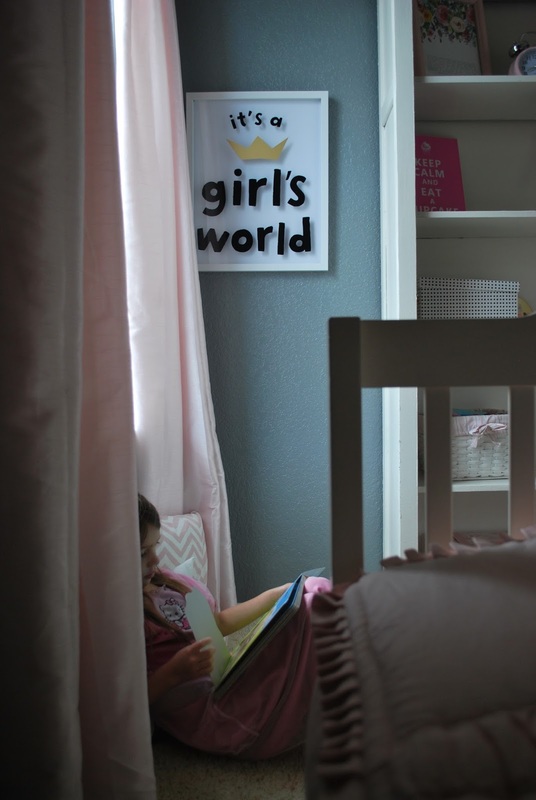 The girls beds can convert from twin beds to bunk beds and we switch it up every few months. Can I tell you the biggest pain in the booty? Making bunk beds. Can't deal y'all. But this bedding by Beddy's makes the whole process of bed making (bunk beds or not) a total breeze. Mia has even taken it upon herself to make their beds each day because she thinks its fun. It is literally as easy as zipping up the sides. There is no need for sheets or extra blankets. The top layer even has a sewn in minky blanket that both girls absolutely love. We've been using it for a couple months now and I am not kidding you when I say both of them LOVE to get in bed each night. They even sleep better because they stay covered all night! And I especially love how put together and clean it all looks when it's made. It's a total game changer. The investment in this bedding is totally worth it. You don't need a top sheet, or bottom. It's all one piece. And each set comes with coordinating pillow sham and pillow case as well. The women behind Beddy's are truly so sweet and have offered to give y'all 15% off your entire purchase. Just use code splendor15 when you check out. I promise you won't be dissapointed with this bedding and it will last you for years! I had so much fun doing this little makeover for them. My other main focus was to simplify the room, take out what they were no longer using, and give it a more grown up look. I gave them a little vanity tp sit at (their favorite part), a bookcase and created a little reading nook for them also. The table in the middle of their beds was a thrift store find from a few years ago. Its an old vintage sewing machine with an actual minty green sewing machine inside. I just painted it white and added pretty knobs. The large black frame is from an old mirror that was once silver. I spray painted it a high gloss black and replaced the mirror with cork board that I covered in polka dot fabric. To make their floral monogram letters I just bought large paper mache letters from Joannes, cut off the tops, spray painted them gold and then hot glued flowers inside. Here's a list of where everything is from. If you have any questions about the bedding please feel free to ask! Don't forget you can use splendor15 for 15% off.